Earn up to 5,000 reward points. Digital piano with stand, sustain pedal, keyboard bench and headphones. 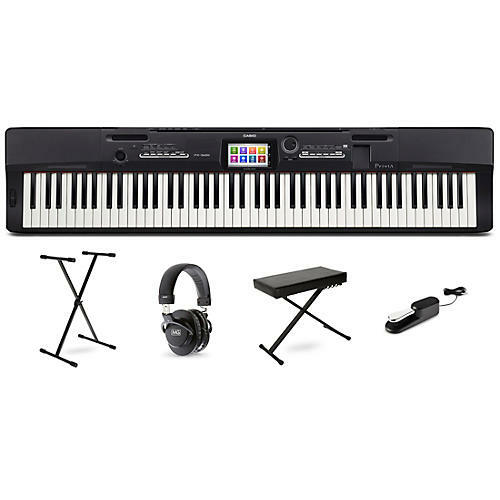 This complete keyboard kit features the Casio PX-360, a portable 88-key digital piano. It also includes a stand, sustain pedal, headphones and a keyboard bench. PX360 is a lightweight portable digital piano with 88 full-size, weighted scaled hammer action tri-sensor keys. The third sensor allows the instrument to more accurately emulate the sound of an acoustic piano, and this extraordinary key bed triggers with the feel of an acoustic piano. The Ebony & Ivory feel on the top of the keys enhance this effect. A sound sample library that features Casio’s 4-Layer Stereo Grand Piano Sound, Multi-Dimensional Morphing AiR Sound Source, Hammer Response Simulator and String Resonance Simulator maximizes this triggering mechanism.